Sapphire crystal with luminous hands and hour markers. Watch is water resistant to 20 ATM. Steel Tegimented bracelet. "Quick delivery, excellent website UI, good updates"
Verified Owner Comments: Although the process was entirely automated, it was seamless, transparent and easy to use. I quickly received order confirmation and notification when the watch shipped. It arrived very well and securely packaged. The watch made it to my door in pristine, new condition. Very easy transaction and would very positively recommend WatchBuys to others. Verified Owner Comments: The is my second Sinn watch. I first picked up the 556 and knew i had to have its big brother the 856, The watch is a tank and has all the Sinn tech to go with it. At 40mm it is the perfect size for my 6.75inch wrist. I would highly reccomend the 856 and watchbuys to who ever is considering it. It may only be my second Sinn but wont be my last. "My new daily wear watch"
Verified Owner Comments: I've had this watch for about a month, including a trip where I took it snorkeling and swimming. It's my favorite daily wear watch so far. Comfortable, looks great, durable (that I've seen so far), and keeps excellent time (I'm seeing +/- < 1 second a day currently). I like having the UTC hand though personally I'd prefer that the UTC hand be completely independent of the hour hand (the UTC hand moves also when you set the time). "Really though - how good can a watch be?" "Sinn 856 UTC Tegimented Bracelet"
Verified Owner Comments: My first mechanical watch and purchase from WatchBuys through the internet. I was extremely satisfied with the entire process from beginning to end! I was VERY particular with the condition of the timepiece, but had equally high expectations of the packaging and delivery procedure. I was not disappointed. The Sinn box and case were thoughtfully packaged within a padded plastic express-mail bag within a sturdy cardboard box. The Sinn labeled box and case were free from any scratch, mark, or greasy fingerprints upon delivery. I examined the watch for any signs of handling or defect with a loupe. The quality and performance of the Sinn 856 UTC to date have been flawless. The experience compelled me to order a Sinn rubber watch strap. I telephoned and placed my order with "Kevin.” I had many questions he answered with patience, expertise, and courtesy. A special thanks to Kevin for his assistance. My customer service experience was "ON POINT” with the quality of my Sinn! Verified Owner Comments: The 856 UTC has been excellent for me. It is an extremely balanced design, suitable for a wide range of dress codes. The dial is clear and easy to read. The case is the perfect size for my 7½-inch wrist and slides easily under a shirt cuff. The movement winds smoothly and is easy to set precisely, including the date and UTC hand. The watch has kept time very consistently and within Sinn's specifications. The bracelet was extremely easy to size using the included tool. It is quite comfortable, thin enough not to be in the way while typing, but substantial enough to balance the weight of the watch. I also ordered mine with an additional leather strap, and changing them is easy and stress-free, thanks to the drilled lugs and the impressive surface hardness of the case. The crown is as prominent as it appears in the photos, and has rubbed on my hand a little bit, but has not caused any discomfort. Verified Owner Comments: Great everyday watch. The tegimented steel looks great and is very high quality. The dial is easy to read and the watch keeps excellent time. Overall, this is a great watch and I would highly recommend it. Additionally, WatchBuys is fantastic to work with. Verified Owner Comments: I have been looking at this watch for years and I finally jumped on it. It wears wonderfully and I look forward to many more years of use as well as future Sinn watches. "Excellent purchase experience, great watch"
Verified Owner Comments: The Sinn 856 UTC Tegimented on bracelet gets a 5/5. Solid construction. Looks amazing. It makes me smile from ear to ear every time I look at it. Of course - no scratches of any kind yet, so I'm planning on this looking pristine and "fresh out of the box" for a long time. I'm glad i researched this watch as much as I did before purchasing as it's truly rewarding to own one. Verified Owner Comments: The Sinn 856 UTC is a fantastic watch. The watch keeps excellent time and the tegimented finish really works well. The guys at watchbuys go above and beyond to make the customer happy. I would recommend this watch and watchbuys to anyone. Verified Owner Comments: Understated, elegant, superb tool watch! Verified Owner Comments: This is my first German watch from WatchBuys, and I love it a lot! I was thinking of Omega or Rolex before I got to know Sinn on this website. Sinn 856 UTC has long list of technology you can get for a watch around $5,000~10,000 price ranges. I believe this watch is just the best bang for the buck. The size 40mm is perfect for me, not too big not too small. I also love the simplicity of the case and the complication of the dial with UTC. It gains only one second per day after a few weeks of break-in, better than the accuracy allowed for chronometer certified watches. The people at WatchBuys are great and they know well how to make their customers happy. When I asked questions, they replied within 24 hours every time. Shipping was also very fast and reliable. A great watch from a great AD makes the best combination for wonderful watch buying experience. I strongly recommend it. Verified Owner Comments: My husband LOVED this watch. I didn't have a Christmas gift for him one week before Christmas. Found in his computer history that he had been looking on WatchBuys at this watch and had saved it in his favorites. They were great letting me order it to be delivered on a specific day in case he didn't like it and I could honor the 3 day return policy. I'd accidentally used the wrong charge card when ordering online and Tim helped me fix everything. Good watch buying experience and a perfect Christmas surprise! Verified Owner Comments: The 856 UTC is rated to 20 ATM and with the tegimented case and bracelet, rugged enough to take what I throw at it hiking and spending time outdoors in the woods. I do not dive frequently enough to warrant a dive watch but I did need a watch that could be submerged without worry. The 856 is not a "Hey Look At Me!" watch, yet it receives many compliments due to it's unique appearance and simple/easy to read dial. Out of the box, I was surprised at the buttery feel of the bracelet. At 40mm, with average size wrists, it is the perfect size for me. The ability to locate North is a bonus and conversation starter. The 856 is for those who need a solid automatic watch for all outdoor activities, but don't need to advertise it. I love the look and feel of it and highly recommend it. Verified Owner Comments: Fantastic Watch, I've worn this for a few months now as my daily watch. I'm in the military and its takes a beating and looks pristine still. It keeps great time and I look forward to purchasing another Sinn in the future. Verified Owner Comments: Outstanding watch! Very thin profile for an automatic, with a readable face in most light conditions. I actually use the UTC hand on this more than my equivalent Breitling UTC. Verified Owner Comments: One of the best all purpose watches made by anyone. The dial is very legible, has the tegimented technology, and has the buttery smooth 2893 GMT movement. Verified Owner Comments: I've had this watch for a week, and it's quickly become one of my favorites. It's highly accurate right out of the box (well within COSC standards), and I have no doubt the Tegimented case and bracelet will stand up to whatever I throw at it. With the UTC feature, the 856 is a great, durable watch for frequent travelers. 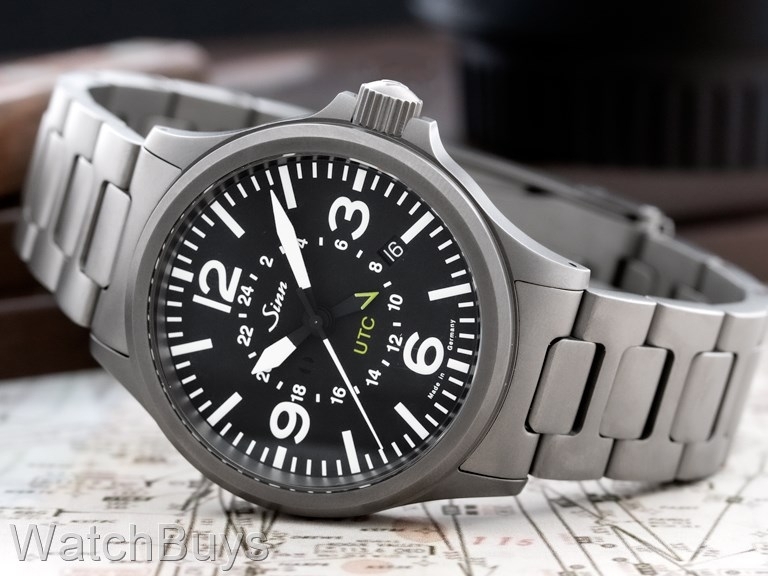 Verified Owner Comments: The Sinn 856 UTC is an outstanding watch that is highly accurate, reliable, easy to read, and not at all flashy, which is important when traveling off the beaten path. Over the three years that I have owned and worn this watch it has proven more accurate than my previous go-to watch, an IWC Mark XII. Highly recommended. "Preferred over same watch on strap"
Verified Owner Comments: Beautiful, simple, modern design. With it's functional utility and design, this watch is a classic. Originally purchased the same watch on a black leather strap, but was not very taken with the aesthetic. Couldn't bring myself to return the watch, but decided to purchase the bracelet and that made all the difference for me. Big fan of the chosen movement for it's well-known accuracy and so far the watch has been keeping time within COSC standards. Glad I didn't return this! Verified Owner Comments: I've liked this since I bought it four years ago. It's solid, modern, high-tech but not geeky, and eminently usable, not to mention easy to read. Solid as a rock, it's also unexpectedly stylish, and its look won't date. Verified Owner Comments: This watch is the perfect size for both dress and utility functions. Its matte tegimented finish is spectacular to look at, and the dial and case are so cleanly laid out, especially with the bezel-less look. I love mine. Verified Owner Comments: This is a great day to day watch. Very durable and functional. It is understated, not too flashy but classy.